Let me start today by making a prediction. When it comes to the referendum on our membership of the EU Government ministers who are usually bound by the principle of collective responsibility will be freed from that convention. It seems to me to be inconceivable that on a matter of such national importance to effectively gag Ministers from explaining their own views is unthinkable. One reason for having a referendum is that there are different views within the main political parties. Yesterday, it was Nine Lessons and Carols at St.Annes’s Church in Tottington in the afternoon and I read the seventh lesson on the news of Christ’s birth been given by the Angels to the shepherds. I watched the Sports Personality of the Year yesterday evening. A great reminder of just how many dedicated and talented sportsmen we have. I don’t vote in these things but my would have gone to Jessica Ennis-Hill personally. I think having already won Olympic gold to marry, and have a baby and then come back to win the World title again is a tremendous achievement. In the end she came third. It will be interesting to see if she can retain the Olympic title in Rio. I was particularly pleased to see A.P. McCoy receive the lifetime achievement award. His has been a truly incredible achievement. Champion Jockey over the jumps for 20 years is truly an achievement worthy of such recognition. Today, I am back in the office in Bury dealing with constituency cases before attending Bury Conservatives Christmas fundraiser this evening. Back to London again today and the situation in the Middle East will dominate proceedings. The main debate today is a general debate on that part of the World. The debate was scheduled by the Backbench Business Committee which I sit on. As always happens when there is the potential for military conflict, even if as in this case it is only the extension of an existing military conflict, I have had many emails from concerned constituents. I will be replying to them all in due course. Yesterday, after attending the Advent Service at St. Anne’s, Tottington when the First candle on the advent wreath was lit I attended a funding raising lunch organised by the Bury North Conservatives Ladies Committee. It is a common misconception that the Conservative Party simply rely on handouts a from big business to keep us going. The reality in places like Bury and I know in most of the Country is that the volunteers have to organise a never ending programme of small fundraising events so we can pay our bills every month. It is a good thing and I never complain about attending. It certainly means I am kept in touch with what our members and often their friends and family are thinking about the issues of the day. Crikey, I can’t believe it is a week since I was driving back from Brighton. I have had a very busy few days with campaigning events, campaign planning meetings and several AGM’s. By a strange quirk of the diary I have had cause to attend five different Annual General meetings in the last few days. First up was the Annual Meeting of Bury Conservatives which we held down in Prestwich this year. All the officers were re-elected and the meeting was concluded with two speeches from myself and then my colleague Councillor Michelle Wiseman the Candidate for Bury South. On Tuesday evening I attended the Annual General Meeting of Tottington St.John’s Cricket Club where I was re-elected as President. It is very enjoyable to attend non-political meetings and there is so much going on at the Cricket Club at the moment not least of which was the change of the name of the Club to Tottington Sports Club to reflect the fact that the club now embraces a Ladies RoundersTeam. Sensibly, in my view, the cricket team will continue to be known as Tottington St. John’s. On Wednesday I was invited to attend the Annual General Meeting of the Bury North Conservative Ladies Committee. The Ladies Committee do an excellent job organising various fundraising events throughout the year which go towards paying for the running costs of the Association. Yesterday, I was asked, in my capacity as President, to Chair the Annual General Meeting of the North West Regions Conservatives at Work organisation. The meeting was held in Morecambe and fortuitously was on the same day as the Morecambe and Lunesdale Conservative Association’s AGM so as I was up there anyway I was able to call in. Although it is ten years since I was their Candidate there are still many people who remember me (although I am pleased to say there were also several new faces who I did not recognise!). Phew! It has been a very busy last 36 hours. I attended the final day of the Conservatives’ Spring Forum in Brighton yesterday and was in the Hall to watch and listen to David Cameron’s unscripted speech which was very impressive. Incidentally, it is noticeable how many front line politicians are now able (and willing) to make speeches without notes these days. We had a good run back up from the South coast without hitting any traffic jams. Today, I have been over to Sheffield where among other things I visited my father and installed his wireless broadband connection. Back to Bury and then I attended the Annual General Meeting of Bury Conservatives which was held in Prestwich this year. Fortunately the meeting was not too protracted as I then had to attend a meeting of the Church Officers at St. Anne’s back in Tottington. Tomorrow I am back on the campaign trail with a day of leafletting and canvassing. I was up in Ramsbottom yesterday for the Annual General Meeting of the Ramsbottom Ward Conservatives. In addition to all the usual business conducted at the Annual General meeting we looked at the possible election dates. Most people still think that the General Election will be held on the same date as the local elections. We will be fielding a new Candidate in Ramsbottom this year as sitting Councillor Diana Ashworth is standing down. The new Candidate is Ian Bevan a local resident who lives in Ramsbottom with his wife and young family. He is a Solicitor by profession and if he is elected will be an excellent addition to the Conservative team at the Town Hall. 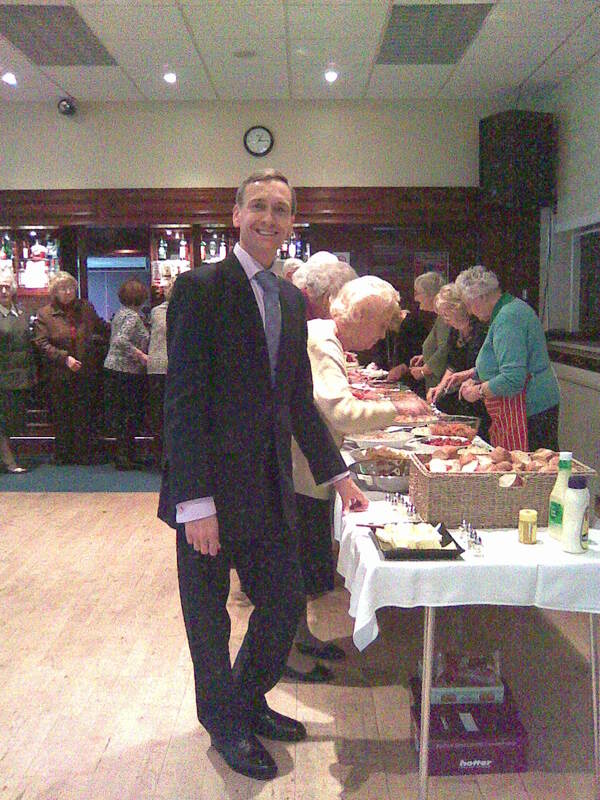 Sunday lunchtime saw me visiting Ramsbottom again for the second time in 24 hours but this time the venue was not the Civic Hall but Ramsbottom Cricket Club and the occasion was a Sunday Buffet Lunch organised by the Bury North Conservatives Ladies Committee.